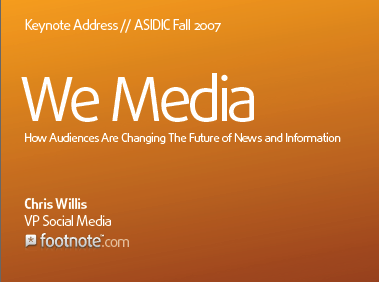 Two weeks ago, I gave a keynote presentation titled “We Media: How Audiences Are Changing The Future of News and Information” (PDF) at the Fall Meeting of the Association of Information and Dissemination Centers in Arlington, Virgina. The ASIDIC meeting attracted folks from organizations like ProQuest, Newsbank, Thompson, Hewlett-Packard, NARA and the Smithsonian together to talk about digital content strategies. If my talk added anything to the conversation, it was this: Whatever your strategy, make sure that Social Media (user contributions, ratings, networks) is a central part of it. People were clearly open to the message. But just telling people what they already know or want to hear is not actionable. So, I put together a few rules for guiding their innovation. They start with a compelling idea & simple solution. They let people make their stuff better, more findable or entertaining. They live by the Golden Rule – be nice to others. They encourage lots of feedback. They create “usable exhaust” – new things are created just by people doing stuff they want to do. They let many groups form easily and quickly. They recognize and encourage the good people in the network. This list will no doubt change over the coming months as more of you help us figure out how to create a better place for you to find, share, relate and discuss your stories. Update: Social Media Web sites are the future of the media business via CNet.